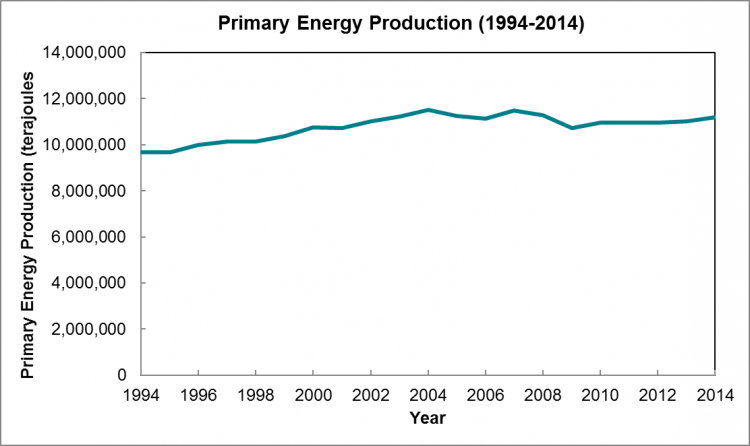 Primary energy production refers to the amount of energy Canadians can produce using the technology that is currently available to us. This indicator measures energy from a number of sources including fossil fuels (coal, oil, and gas), hydro and nuclear electricity and renewable resources such as solar, wind, and wave energy. Energy is measured in petajoules. According to Statistics Canada one petajoule represents roughly the amount of energy it takes to power Montreal’s Metro system for one year. Because of the amount of power used every year in Canada, we report it in terajoules – the equivalent of 100 petajoules. This indicator does not distinguish between “good” and “bad” energy regarding secondary impacts of energy use such as pollution. Primary energy production influences wellbeing by providing the energy needed to power every home, business, and community service that is relied upon by Canadians.